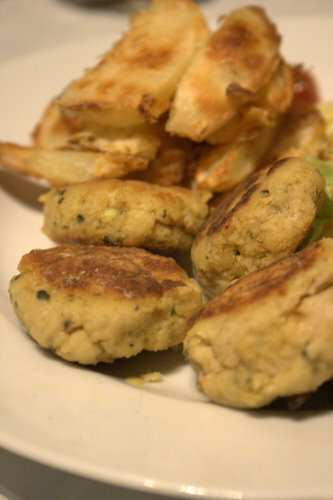 I think rissole, which almost rhymes with gristle, is an unfortunate name with connotations of a poor man’s dish – made from substandard scraps. The only substandard thing here was with my photography, I still do not have a new prime lens, and I was keen to eat my supper, rather than light and style it. 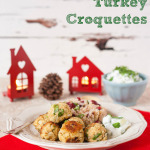 From henceforth I shall refer to these delicious morsels as croquettes, which sounds altogether far more appetising. These were made from the last remains of the Christmas turkey found in the depths of the freezer. Since making them, variations have made frequent appearances on our menu, mix it up with different left over meats and flavours. Delicious. Love Thai food? Then check out my Vegan Red Thai Curry! If you try this Recipe: Thai Curry Turkey Rissoles or Croquettes please tag #FussFreeFlavours on Instagram or Twitter. It is amazing for me when for me when you make one of my recipes and I really do love to see them. You can also share it on my Facebook page. Please pin this recipe to Pinterest too! Thanks for reading Fuss Free Flavours! A delicious way to use up leftovers. Place all the ingredients in the food processor and pulse until mixed. You want the mixture to hold together, but still have some texture. Roll the mixture into 10 equally sized patties and coat with flour. Fry for 3 to 4 minutes on each side until golden. Serve immediately with potato wedges.